DN 20 – ¾” “HVTC-90” constant temperature unit is a low temperature system used in floor heating systems. Sūkņu grupa var tikt izmantota ar sūkņiem no dažādiem ražotājiem. Sūknis komplektā neietilpst. 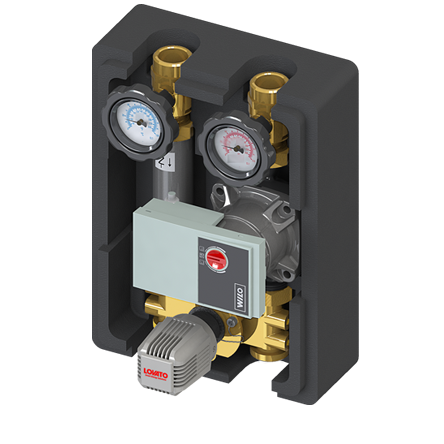 It includes a 3-way mixing valve regulated by a thermostatic actuator, by which the desired constant flow temperature is set. It has a safety system consisting of a contact thermostat applied to flow and connected to the pump, which assures the switching off of the same, if temperature rises above the maximum level set. The standard unit is supplied with right or left flow. Copyright © 2015-2019 Tava Sistēma.